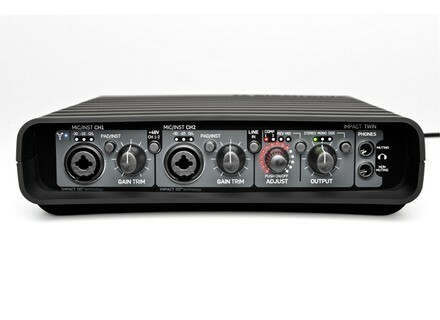 Impact Twin, FireWire audio interface from TC Electronic. 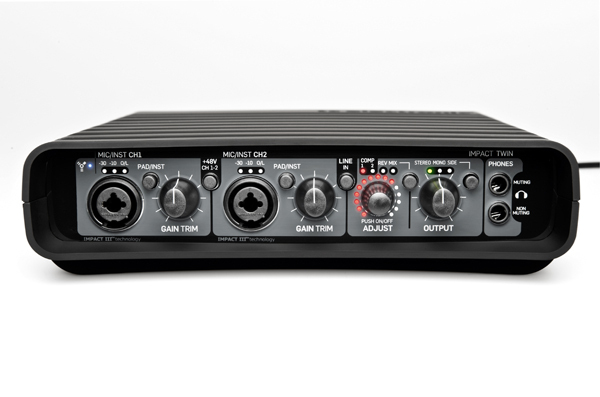 The TC Electronics Impact Twin is a firewire interface with a total of 14 inputs: 10 of them are digital (the signal comes from either the ADAT or the S/PDIF inputs) and 4 are analog, with line inputs at the back of the unit and two mic/line inputs at the front with phantom power available and two very good preamps. It also has MIDI in/out, four output channels (or two stereo pairs) and a headphone output. On the processing side, the Twin's converters can go up to 24 bits/192kHz of resolution (but only 48kHz for the ADAT channels), and it has an awesome control panel software with built-in eq, compression, reverb, etc. I use it with my mac mini (2011, i5, 8GB RAM), with Logic Pro X and sometimes Reaper, mostly to produce soundtracks for videogames. I usually record only one or two channels at once, but have used the Twin with all the 8 ADAT channels (audio coming from a yamaha digital mixer) a couple times and it worked flawlessly. Latency is very low, and thanks to the control panel you can use the built in effects to have a nice sounding chain without using any plugins from your DAW - and still record only the dry signal. The patching on this control panel is pretty simple and while some effects have only one knob (like the compressor) you can hear that it affects different parameters at the same time (ratio, attack), which keeps things simple and efficient during a session. The reverb sounds great. The pre amps are really good, transparent and nice sounding. A friend of mine who also has one said once that "it sounds a little too harsh in the upper mids", but honestly I've never really noticed it. I also like the headphone amp a lot, no matter what headphone I plug into the Twin, it always sounds clearer than the same one in another interface. Another good thing are the two phone outputs: one mutes the output to the monitors and the other doesn't, cool resource. Never had any issues with drivers stability or compatibility with the mac, I pretty much just installed the Control Panel thingy and was ready to go. The basic stuff is plug and play, and if you want to go into everything that the control panel can do for you, a look at the manual might help. Never needed the customer support, but other people I know had and they say is pretty good. Also I've never dropped the unit, but it looks like it wouldn't suffer much, it looks very well built, sturdy. - I can make my regular (two channels) recordings at home and easily plug it into any ADAT (from a mixer in a studio, for example) to get more channels if needed. - The audio quality, both from the pre amps and the headphone output. - The effects in the control panel and the bundled plug ins. - In 2014, let's face it: firewire is kind of a problem, we don't know how long this is going to last. It's the only thing that would keep me from buying another one. Overall, if you already have a computer with a firewire connection and don't plan to change it too soon, the Twin is definitely a great choice. In my opinion, the best audio interface in it's price range, probably even better than some other ones $100 or $150 more expensive. stompboxjon's review"comes with Ableton "
The Twin is made by TC Electronic and it is a very simple interface to use with a lot of ins and outs. It is a 14 in and 14 out interface that has two great microphone preamps and comes with a few plug ins and Ableton software. I have used this interface with Abelton, Acid, Reason, FL Studio and a few other programs and it has worked fine with all of them. For a while this was the only interface that I had owned due to getting my home studio redone so I had to use it on my PC running Windows XP (at first) then on my Vista PC and it never gave me a single issue no matter which computer I ran it on or which software I ran it with. It seemed to be very versatile and had great preamps for it to be this price. I love everything that TC Electronics puts out because it is always made with quality and they have great customer support. I have had some smaller issues with TC stuff in the past but the support people on the phone always walked me through it without paying a penny. This interface was great right out of the box and I had no issues with installing and the drivers where very stable. This interface was small and compact, the manual was clear and sufficient (though it was a lot of pages and I don’t understand why). All of the main and basic functions of this interface are easy to use and work with. If you use Ableton than this interface will pretty much automatically work and you will not have to do anything if you install the Ableton that comes with it and follow the instructions you will be up and running in as little as 15 minutes. This interface is compact and small, it gives a great quality and the preamps are clean and warm. This unit should cost about 50 dollars more than what it does considering the quality of the preamps and how universal the interface is with other software and computers. RickD's review (This content has been automatically translated from French)" Very clean, complete"
I chose this model for its comprehensive connectivity (XLR, TRS jacks, digital coaxial, ADAT, MIDI) and the fact that it can operate without a computer and therefore live (preamp, compressor, reverb). And it's the TC I already had the G-Force, very clean, I have not been disappointed by the Impact Twin. Note that there are two headphone outputs on the front 6.35mm, one that mute the analog outputs, the other not, and the volume is at the front, stereo, and mono sidechain. All this is very well thought out. I have so far not used the card to save on PC other than for a comparison test between my two preamps SPL Channel One and my Roland VS-2480. I can not say how it behaves with Pro Tools multitrack etc. but I know that it is recognized and everything seems to work as it should. No installation on Windows XP 32-bit or Windows 7 Ultimate 64-bit problem. I can not find clear archi manual but you get it to work, feeling a little. I've had two or three years. I use it as a PC audio output to listen to music on my JBL LSR 2325P with balanced cables Vovox Sonorus and the sound is very clean and detailed. The value for money is excellent (I had priced USA, must say). The preamps are very good, the headphone outputs are also good. For size etc. is there a more complete and versatile, and quality TC is already proven all, I think. Note that in theory should be a Firewire card that does not use VIA chipset but rather Texas Instruments. So chips Firewire Asus boards usually do not work with this card. I bought a no-name card $ 4 and it works nickel. Chosen for the Firewire port, midday connectivity, 2 headphone jacks (one that mutes the output HPs, the other not), sample rates up to 192 kHz, stability, and quality preamps. Do they fool stable drivers: Yes the compatibility with mountain lion pos of problems for installation: I dt again several times before the installation was working;? Installation on Seven (to test) does not pos problems. Is Gnrale easy configuration: The interface is clear enough to quickly understand the operation. Peculiarity that I like least:-controlling volume should be ALSO accessible via the front panel; not just by the software. Bought B-Stock, and in comparison to other in its class, its price is everything - is reasonable. I would do this choice without hsiter. Sky Fu's review (This content has been automatically translated from French)" "I ais no way!" So we ferras with"
The road was long and winding and you can select a sound card! I went to this little TC by following the various opinions here and there. You should know that this is my first (and for a moment I hope) sound card worthy of the name. My opinion of this product is not very objective, but it is an opinion all the same. So we must remember that it is FireWire! And that this reputation is bad PC (firewire eh not TC). I therefore warn potential buyers that it will opt for a firewire pci card "texas instruments" is that I was done and I ais has (almost) no problems. When you first install it works very well, after NOT TOUCH! At the risk of having to re-install all. Else NOT CONNECT THE TC UNTIL YOU INSTALLED THE CD!! Otherwise walk in. / blue screen / hysterical! To install it I was told the above, and to follow the protocol as it works, not touch! Switch-stereo / mono / side really top! No-button for volume headphone!! that is to say that either you or you listening monitors branch headphones that came in the mute monitors, but you do not just turn down the volume of the monitor by the sounds in the headphones, it's not all practice ca!! But if made or are invested in a controller monitors. -It does not "cut" it!! The volume, there is sound coming out again!! Not much, but as itself. The whistle-feeding slightly, namely that I board opted for immedia sector. One little-not racker!! it would have been good as well! All good but it is actually set asse quickly adapted my work I board! Note the money, I do not no this is my first card! I was looking for an external sound card of good quality at a reasonable price to start. As I am mostly electronic music, not need a lot of inputs / outputs. I hesitated with Saffire PRO 24 DSP but for lack of notice, I took a little chance. No problem with the installation, I checked my Firewire chipset was indeed a Ti because Via has a bad reputation. I use it for a few months and I am satisfied for now. The choice was made on the reputation of TC electronics and the presence of the sequencer Ableton Live Lite. The quality of plastics is good, the finishes too. Its side, it's clean but I did not reference because it's my first card. If I were to buy a sound card now, I'd probably for a card equipped with USB for firewire (IT) becomes more difficult to find on newer motherboards. Cf thomann or tcelectronics.com for details. The drivers are very stable under Mac, no problem for now. I go with my guitar in Live8 Amplitube2, nickel and nothing wrong. I 8ms latency, I expected to have less (the IO2 was 9 ms latency), but I'll try to get buffers. The app comes with is cool. It can control the DSP effects built into the card (reverb, compressor and equations). Practice but I have no use because I live in while vst but the idea is good to correct the sound (almost) upstream. The only thing to blame him is the length of the included cable (1m), I had to buy another in order to make the right laptop. There is a firewire 400 to 800 (fortunately for that matter), not stupid! The plug installation cd, install and play, not bad =). Everything is updated automatically. As said earlier, I mainly need additional inputs and I "flashed" on the twin impact. Very pleasant to use, I do not regret my purchase (so 500chf € 345). I do not use the DSP effects for the moment but why not. What characteristics have motivated your choice? I had a Konnekt 24D before and I was very happy (before it lets go of me) so my choice fell naturally on the twin impact. 9 ms latency that rolls. Preferred level incompatibilities Texas Instruments Firewire chipset that's better. The control panel of the Konnekt and different but well thought out. The value price for a home studio is amazing, good preamps, integrated channel strip extra (TC effect) the reverb very well. What I regret is not being able to rack ... I could with the old.